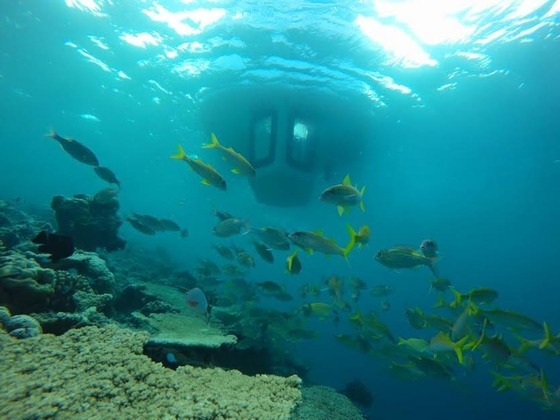 (Seychelles News Agency) – For sea lovers wanting to discover the amazing marine life in the vast ocean around the Seychelles islands, taking a plunge into the crystal clear waters is the way to go. 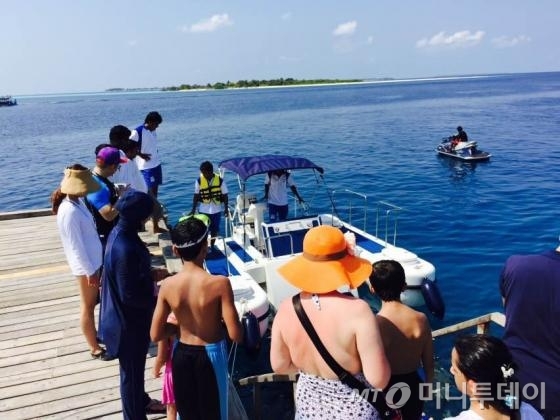 A snorkelling or diving expedition, however, is not everyone’s favourite thing to do, leaving those who are not willing to get their feet wet to choose other options. 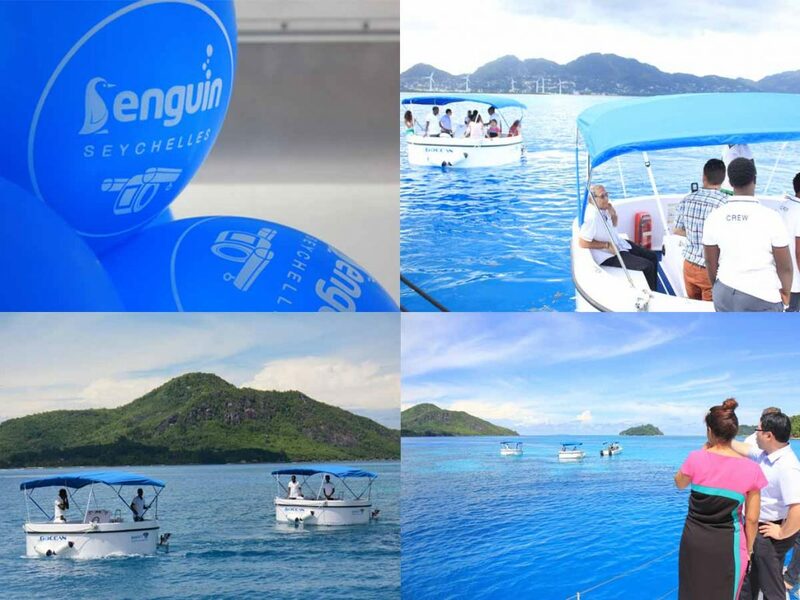 While glass bottom boats have long been an ideal choice, locals and visitors to Seychelles will now be able to also choose a ‘penguin experience’ to explore the underwater world of the 115-island archipelago in the western Indian Ocean. 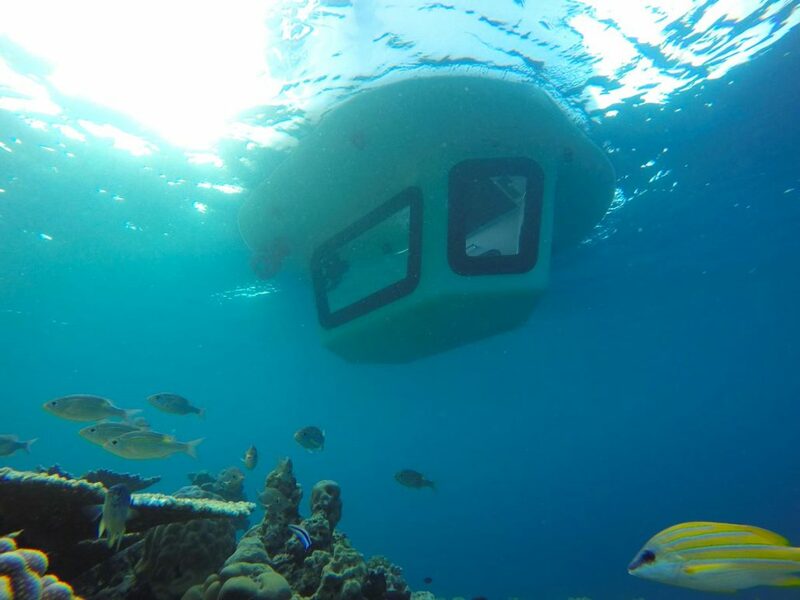 The Penguin is a compact semi-submarine with two floating hulls, a central underwater cabin and three large windows, which makes a dry, up-close encounter with bright colourful fish swimming around the reefs at two metres deep possible. 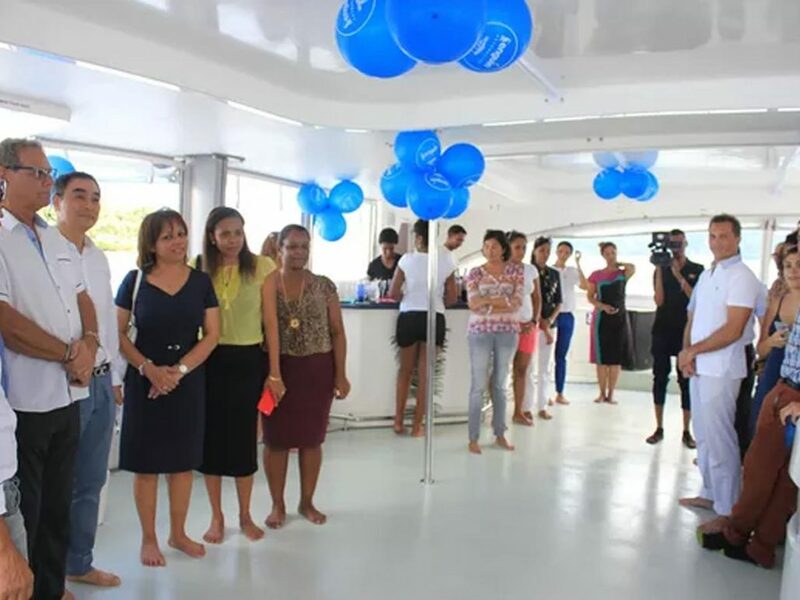 The St Anne Marine Park, located about 5 kilometres from the Seychelles main island, Mahé, and one of the most popular snorkelling spot in the island nation, provided the ideal setting for the launching of a pair of these semi-submarines on Tuesday. 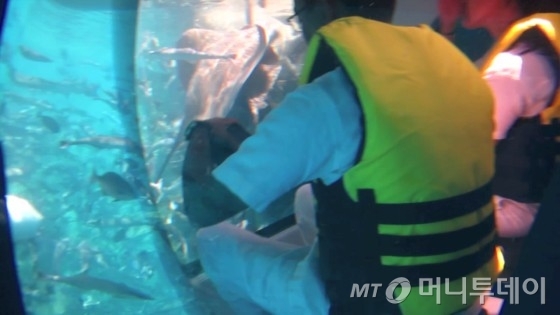 The venture is being undertaken by Creole Travel Services, a local tourism business of the JFAlbert Group of companies, in collaboration the HLB company, a South Korean firm specializing in the manufacture of lifeboats, including the Penguins. “These Penguins have been launched in the Maldives. They have five of those and 60 percent of their clients are Chinese visitors, because they love to discover. 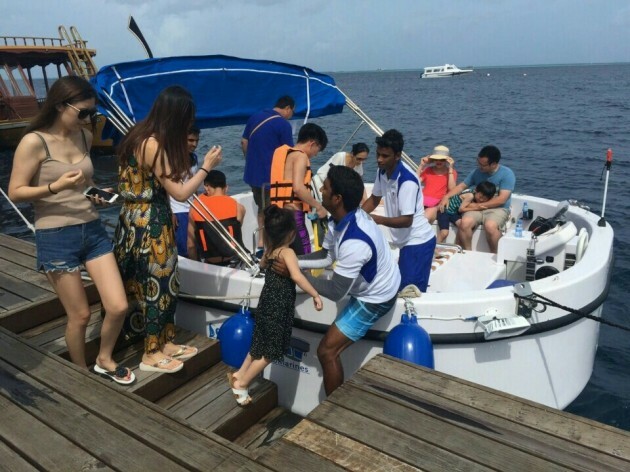 So it’s something good for Seychelles, which is trying to develop the Chinese market, but also for other groups like families and children who cannot swim,” the general manager of Creole Travel services, Guillaume Albert, told SNA. 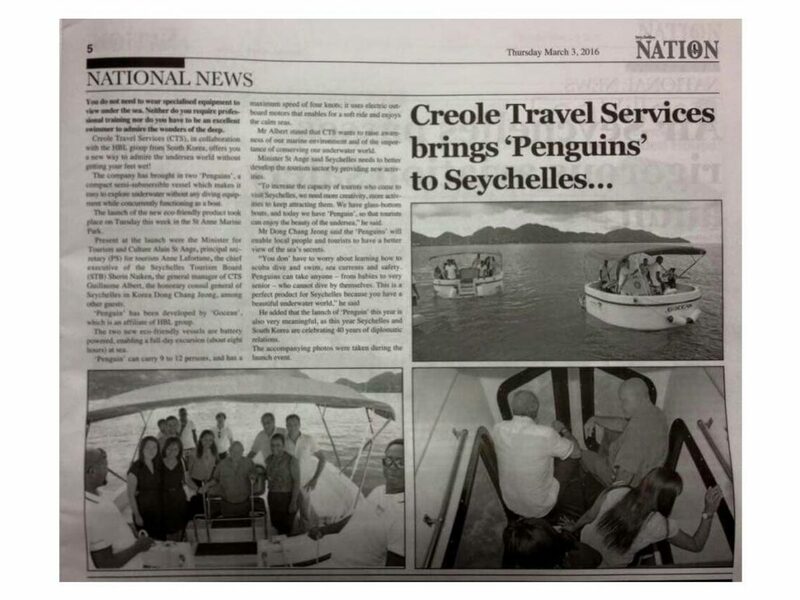 The collaboration between Creole Travel Services and South Korea’s HLB Company was initiated by the Seychelles Honorary Consul in South Korea, who is also the brains behind the 2008 Eco-Friendly Marathon, which has now become an annual event. The small vessels are also eco-friendly, as their motors run on battery power. “The battery can last for eight hours meaning we can have a full day or twin half day operations on a full charge,” Roland D’Offay the director of operations at the JFAlbert Group of companies told SNA. 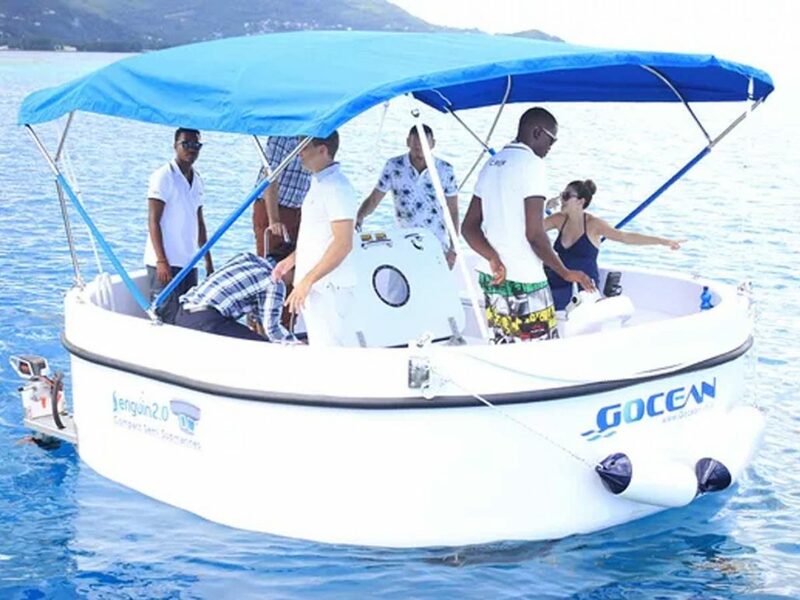 D’Offay explained that the two Penguins have been brought in as Creole Travel Services is in the process of replacing its aging fleet of glass bottom boats. 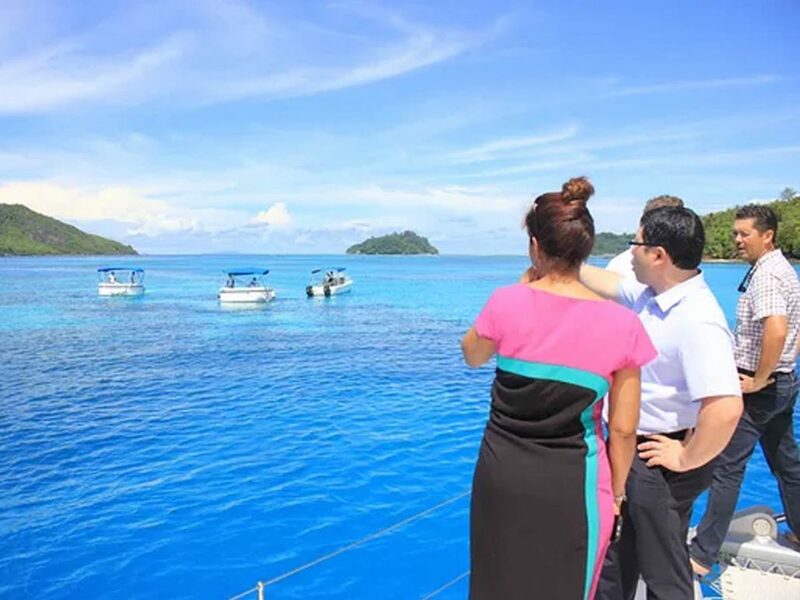 The initiative has been welcomed by the tourism authorities as an innovative way to increase tourismearnings. 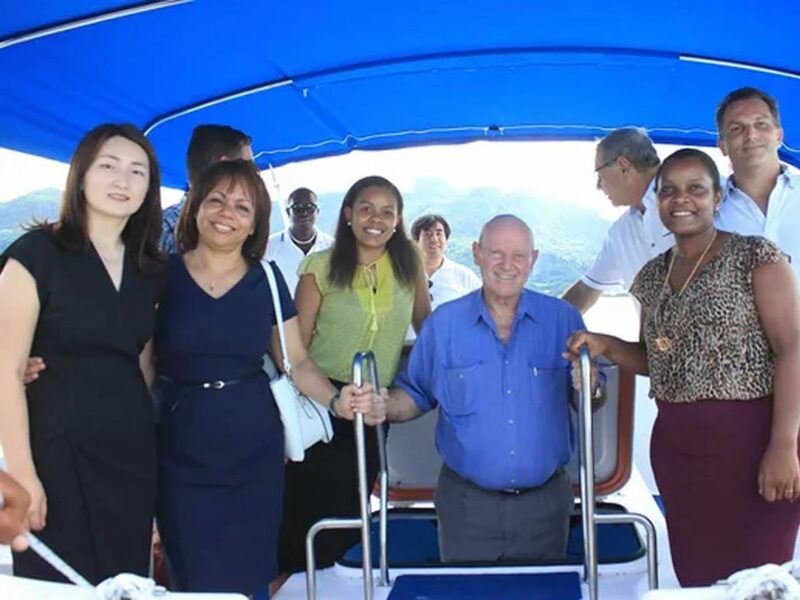 “We need better yield from the Seychelles tourism industry. We can keep on bringing tourists but this will not increase the yield. To increase the yield we need facilities, we need activities. Bringing in the new Penguins is offering something new for the tourists,” the tourism minister Alain St Ange said on Tuesday. 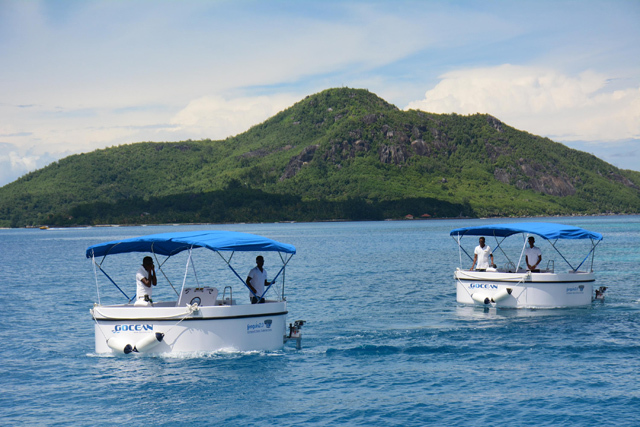 It is hoped that Seychellois and tourists alike would be interested, with Creole Travel Services planning to offer night excursions and include educational programmes on the outings, to create awareness about the Seychelles’ marine environment. According to Albert, the cost of one of the semi-submarines is around $115,000. The fee to ride on the new Penguins, hasn’t been set yet. 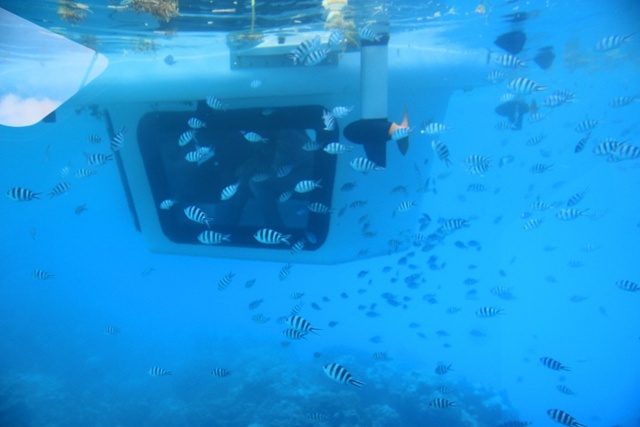 The penguins can carry 12 people at a time, eight on the main deck and four in the underwater cabin. 크리올 여행사가 세이셸로 ‘펭귄’을 데리고 왔다. 바다속을 보기위해 전문 장비를 착용 할 필요가 없으며 전문 교육을 필요로 하거나 깊은 바다의 경이로움을 감상할 수 있는 훌륭한 수영기술이 필요없다. 크리올 여행 서비스 (CTS)는 한국의 HBL 그룹과 공동으로 당신의 발이 젖지 않고 해저 세계를 감상 할 수 있는 새로운 방법을 제공한다. CTS는 보트 역할을 하면서 다이빙 장비없이도 쉽게 수중탐험 할 수 있는 컴팩트한 친환경 반 잠수정인 펭귄 두척을 구매하였다. 이 새로운 친환경 제품 런칭이 세인트 앤 해양 공원에서 이번 주 화요일에 열렸다. 런칭행사에는 세이셸 문화관광부 장관 Alain St Ange, 관광청 비서실장 Anne Lafortune, 세이셸 관광청장 Sherin Naiken, 크레올 여행사 제너럴 매니저 Guillaume Albert 그리고 한국 세이셸 명예총영사 정동창 영사가 참석하였다. 이 ‘펭귄’은 HBL 그룹의 계열사 인 ‘Gocean’에 의해 개발되었다. 두척의 새로운 친환경 보트 ‘펭귄’은 전기 배터리로 구동되는 제품이며, 하루 종일 여행 (약 8 시간)이 운항이 가능하다. 또, ‘펭귄’은 9~12 명이 탑승가능하며, 최고 4 노트(KNOT)의 속도를 가지고 있다. 부드러운 운항이 가능한 전기 아웃 보드 모터를 사용하여 진정한 바다를 감상 할 수 있다. 알버트(Guillaume Albert)는 크레올 여행사(CTS)가 우리의 해양 환경과 우리의 수중 세계를 보존의 중요성에 대한 인식을 제고하겠다고 밝혔다. 장관 세인트 앤지(Alain St Ange)는 “ 세이셸은 더 나은 새로운 레저을 제공함으로써 관광 산업을 개발할 필요성이 있고, 세이셸을 방문하고자하는 관광객을 증가 시키기 위해 관광객 유치에 더 많은 창의성이 필요하며 더 많은 활동을 해야한다. 우리는 글라스 바틈 보트를 가지고 있으나 이제서야 ‘펭귄’을 가지게 되어 관광객이 해저의 아름다움을 즐길 수 있게 되었다“ 라고 말했다. 정동창 명예총영사는 “ ‘펭귄’이 지역 주민과 관광객들에게 더 멋진 바닷속 비밀을 알 수 있게 할 것 이며, 수영이나 스쿠버 다이버 기술을 배울 걱정이나 바다 상황 및 안전을 걱정할 필요 없게 되었다. 또한 ‘펭귄’은 스스로 물속에 들어갈수 없는 아이에서부터 노약자에 이르기까지 모든 이들이 바다속을 누릴수 있게 해주며, 아름다운 바다속 세상을 볼수 있기 때문에 세이셸을 위한 완벽한 제품이다“ 라고 말했다. You do not need to wear specialised equipment to view under the sea. Neither do you require professional training nor do you have to be an excellent swimmer to admire the wonders of the deep. 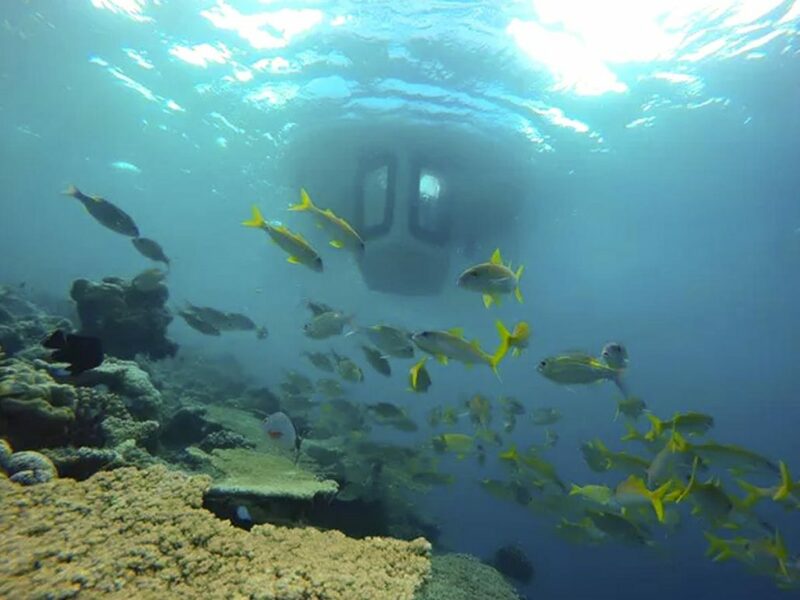 Creole Travel Services (CTS), in collaboration with the HBL group from South Korea, offers you a new way to admire the undersea world without getting your feet wet! 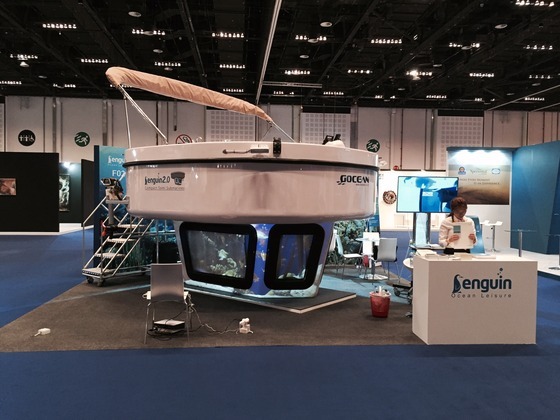 The company has brought in two ‘Penguins’, a compact semi-submersible vessel which makes it easy to explore underwater without any diving equipment while concurrently functioning as a boat. 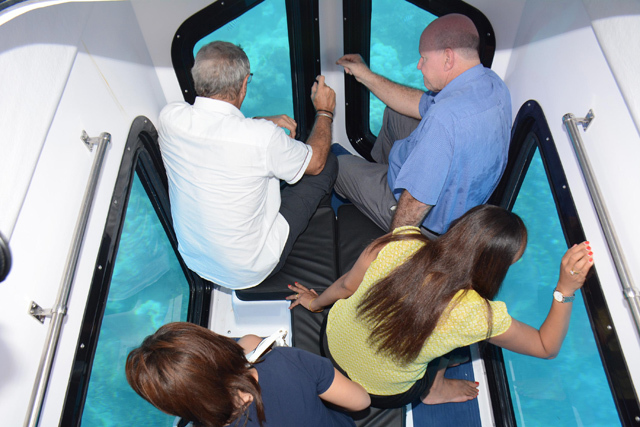 The launch of the new eco-friendly product took place on Tuesday this week in the St Anne Marine Park. Present at the launch were the Minister for Tourism and Culture Alain St Ange, principal secretary (PS) for tourism Anne Lafortune, the chief executive of the Seychelles Tourism Board (STB) Sherin Naiken, the general manager of CTS Guillaume Albert, the honorary consul general of Seychelles in Korea Dong Chang Jeong, among other guests. ‘Penguin’ has been developed by ‘Gocean’, which is an affiliate of HBL group. 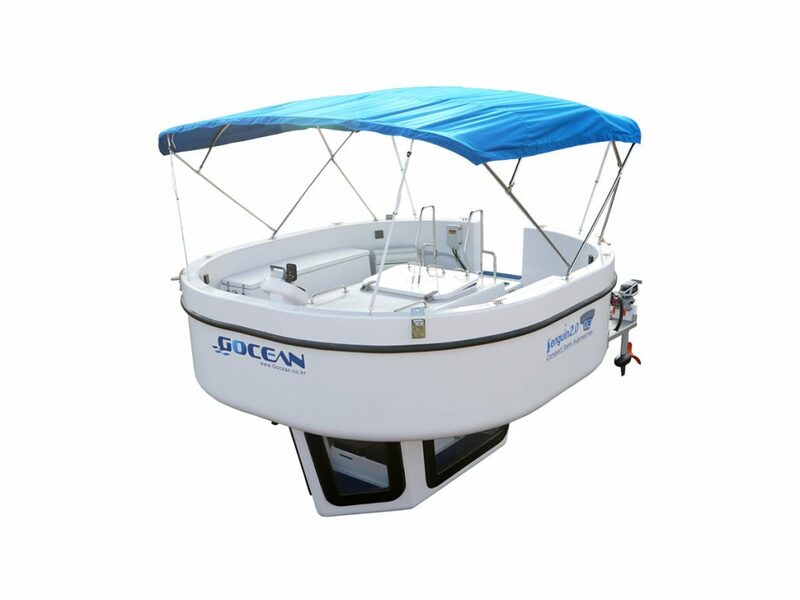 The two new eco-friendly vessels are battery powered, enabling a full-day excursion (about eight hours) at sea. ‘Penguin’ can carry 9 to 12 persons, and has a maximum speed of four knots; it uses electric outboard motors that enables for a soft ride and enjoys the calm seas. Mr Albert stated that CTS wants to raise awareness of our marine environment and of the importance of conserving our underwater world. Minister St Ange said Seychelles needs to better develop the tourism sector by providing new activities. “To increase the capacity of tourists who come to visit Seychelles, we need more creativity, more activities to keep attracting them. 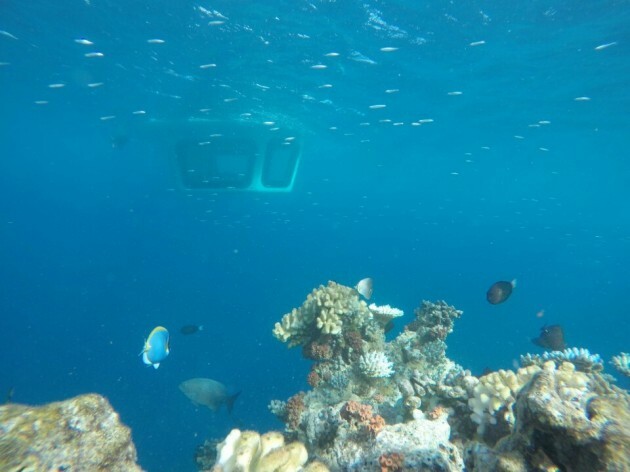 We have glass-bottom boats, and today we have ‘Penguin’, so that tourists can enjoy the beauty of the undersea,” he said. Mr Dong Chang Jeong said the ‘Penguins’ will enable local people and tourists to have a better view of the sea’s secrets. He added that the launch of ‘Penguin’ this year is also very meaningful, as this year Seychelles and South Korea are celebrating 40 years of diplomatic relations. The accompanying photos were taken during the launch event. 바이오사업과 구명정 사업을 영위하는 코스닥 상장사 에이치엘비(HLB)가 차세대 제품으로 개발한 해양레저용 반잠수정 ‘펭귄’이 유명 휴양지를 중심으로 인기를 끌며 캐시카우로서 가능성을 보여주고 있다. 지난해 업그레이드 된 펭귄2.0은 무게 4.3톤, 길이 4m, 최대 속도 4노트로 12명이 탈 수 있는 반잠수정이다. 선체 4분의 3이 바다속으로 잠겨 선실에서 바다속을 구경할 수 있게 돼 있고 물밖의 넓은 데크에서는 스노쿨링, 선셋크루징 등을 즐길 수 있도록 설계돼 있다. 원래 공학자들이 불가능하다고 손사래를 쳤던 제품이지만 40년간 구명정을 생산해온 세계 톱수준의 구명정기술을 바탕으로 기술적 안전문제를 마침내 해결하고 상업화의 길을 텄다. 제작은 에이치엘비 관계사인 고션이 만들고 해외사업은 계열사인 펭귄오션레저가 맡고 있다. 펭귄의 해외 레저사업은 관광지로 인기높은 인도양 몰디브를 중심으로 이뤄지고 있다. 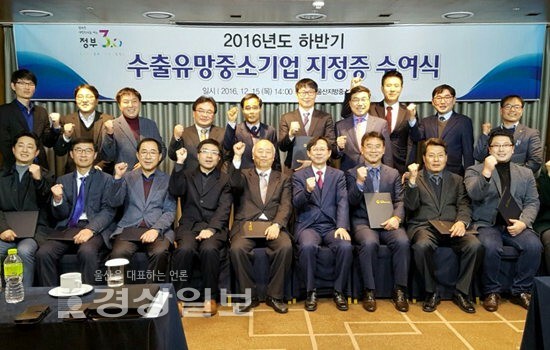 펭귄오션레저는 몰디브 현지에 법인을 만들어 현지 휴양지와 손잡고 반잠수정 레저사업을 전개하고 있다. 이들 지역 휴양지가 고급이다 보니 1인당 탑승가격이 100달러 안팎의 고가여도 인기가 높다고 이 회사는 귀띔했다. 지난해 4월 몰디브의 키하드 리조트(Kihaad Resort) 1척을 론칭했고 작년 12월 이보다 고급인 아밀라 푸시 리조트(Amilla Fushi Resort)에 1척을 추가 론칭, 최근 본격운영에 들어갔다. 17일 펭귄해양레저에 따르면 키하드 리조트에는 실제 운항 6개월만에 13만달러 매출을 올렸고 아밀라 푸시 리조트에는 최근 한달간 약 4만달러 수입을 올렸다. 올해 4월에는 인도양 섬나라중 한곳인 세이셀공화국(Seychelles)의 최대 그룹사인 UCPS와 파트너십을 맺고 서비스를 오픈한다. 김자우 펭귄오션레저 대표는 “UCPS가 건설과 리조트는 물론 여행사를 겸하고 있어서 좋은 파트너가 될 것으로 기대한다”고 말했다. 이외 몰디브에서는 올 5월 다른 리조트에도 추가로 서비스를 개시하는 것도 추진하고 있다. 중국에서는 지난해 초에 성도에 있는 세계최대 아쿠아리움인 시사이드(Seaside Mall)에 2척을 판매했다. 이 펭귄은 공급상에 약 1억원으로 판매됐다. 약 15분 정도 걸리는 수족관 관람을 위해 고객이 30분 이상씩 대기해야 할 정도로 인기를 끌고 있다고 회사측은 설명했다. 펭귄은 개발에 5년, 사용자 설득에 3년이라는 시간을 투자했다. 2013년에 프라이빗용 펭귄1.0을 출시한 데 이어 지난해 유람용으로 적합하게 업그레이드 된 펭귄2.0을 출시, 상업운영에 들어갔다. 펭귄 상용화에 시간이 걸린 것은 생긴 모양이 유선형이 아닌 사각형이어서 안전성에 대한 우려가 많았기 때문이다. 조선공학을 전공한 과학자들 조차 ‘이게 가능한 것이냐’고 비웃었던 제품이다. 에이치엘비는 세계2위의 구명정 제조업체로 40년간 다진 노하우를 펭귄에 적용했다. 우선 오뚝이 원리를 적용해 무게중심이 항상 물속에 있게 했다. 덕분에 무게가 4톤이상으로 무거워졌지만 파도가 쳐도 넘어지지 않는다. 물속에 4분의3이 잠겨있는 점을 고려해 배터리, 모터 등 전장품에 방수처리를 확실히 했고 선체도 일반 모터보트의 30배 강도의 재질을 썼다. 잠수되는 선실 유리는 아쿠아리움에서 쓰는 아크릴유리로 돼 있다. 설사 충돌 등으로 파손돼 선실에 물이 차더라도 가라앉지 않기 때문에 비상시에는 갑판으로 올라가 구조를 요청하면 된다. 처음에 리조트에서도 펭귄에 대해 안전성에 대한 의구심이 많았지만 시범운영에서 안전성이 입증되며 이용에 자신감을 가진 모습이다. 김자우 대표는 “무엇보다도 젊은층 중심의 장비들만 득세하던 기존의 해양레저시장에서 펭귄이 가족 중심의 장비가 등장하니 반응이 더 뜨거운 것 같다”며 “공학도 조차 선체구조상 불가하다고 한 것을 끝내 만들어서 유럽인증까지 받아 출시했는데 이제야 안전성에 대한 의구심이 없어지면서 해외 리조트 관계자들이 적극적으로 호응하고 있다”고 말했다. 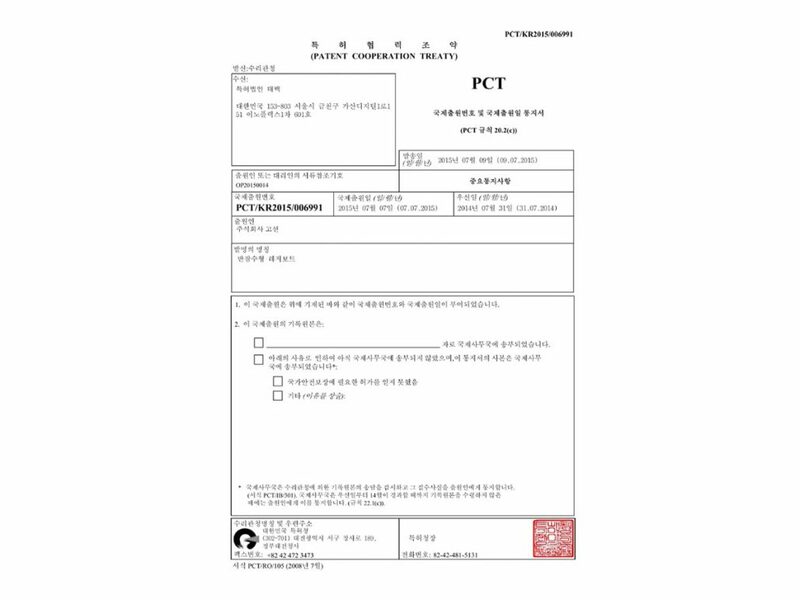 PCT(Patent Cooperation Treaty) international application for the semi-submarine leisure boat was registered. 에이치엘비 (17,100원 100 -0.6%)의 관계사인 고션이 개발한 해양레저용 반잠수정 펭귄이 휴양지 몰디브에서 운항 ‘대박’을 터뜨리고 있다. 11일 고션에 따르면 지난 3월 몰디브의 키하드 리조트(Kihaad Resort)에서 운항을 시작한 펭귄은 5월 한달 동안 매출 2만 5000달러를 기록했다. 펭귄은 고션이 5년간의 개발기간을 거쳐 양산한 세계 최초의 해양레저 반잠수정이다. 바닥이 25mm 아크릴 유리창으로 만들어 탁 트인 바닷속을 감상할 수 있다. 초등학생도 쉽게 운전할 수 있어 연인과 가족 단위의 관광객들에게 호평을 받고 있다. 고션은 단순히 펭귄을 판매하는데 그치지 않고 수익을 나누는 투자 개념으로 해양 리조트들과 논의하고 있다. 키하드 리조트의 총 수익의 절반도 펭귄의 판매 및 마케팅을 맡고 있는 펭귄오션레저가 인식하게 된다. 키하드 리조트는 성인 기준 펭귄 사용료를 90 달러씩 받고 있다. 하루 운영 횟수는 총 20회다. 5월은 몬순(우기) 기간으로 운항횟수가 일 평균 8회 수준에 머물렀다. 고션은 몬순이 끝나는 7월부터 운항률이 상승할 것으로 기대하고 있다. 펭귄의 1척 가격은 약 8만 달러 수준이다. 현재의 실적 추세라면 약 3개월이면 선체 값을 모두 회수 할 있는 셈이다. 키하드 리조트의 성과를 보고 주변의 리조트들도 펭귄의 도입을 적극 검토 중이라고 회사 측은 전했다. 김자우 펭귄오션레저 대표는 “펭귄은 최소 운항년수가 5년으로, 몰디브는 현재 추세라면 3개월이면 투자비를 회수할 수 있다”며 “나머지 57개월은 관광객의 만족도를 높이는 캐시카우 역할을 톡톡히 할 것”이라고 말했다. 고션은 지난 7년 동안 해양 레저 시장에서 관광객의 이목을 끌만한 레저 장비가 없었다는 점에 주목하고 있다. 소수 인원이 즐길 수 있는 펭귄 1.0에 이어 패키지 관광객용(9인용) 펭귄 2.0을 출시한 이후 전 세계 해양 리조트의 문의가 크게 늘고 있다. 최근에는 아웃보드 엔진을 장착한 플라잉 펭귄을 출시해 관광객들의 다양한 수요에 부합하는 제품을 내놓았다. 고션은 오는 7월 30일 호주에서 열리는 시드니 국제 보트쇼에 펭귄 2.0을 출품해 본격적인 마케팅을 시작한다. 펭귄 2.0은 해양수산부의 해외보트쇼 참가지원 제품으로 선정된 바 있다. 오승락 고션 대표는 “펭귄을 통해 나이나 신체의 불편함과 무관하게 아름다운 바다를 즐길 수 있다”며 “이달 중 플라잉 펭귄을 출시해 포트폴리오를 강화하고, 올해 실적 턴어라운드를 위해 힘쓰겠다”고 말했다.